Age: anyone that enjoys coloring! Magic Stix Washable Markers are awesome. They come in a 24 pack that is in its own cart case. 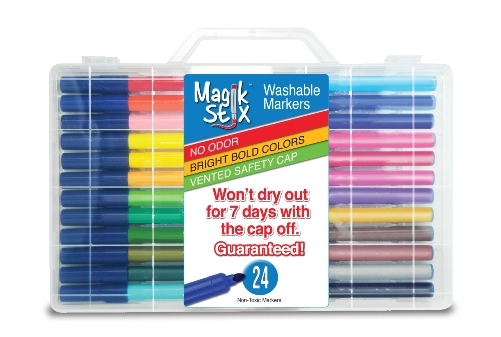 These markers claim to not dry out even without the cap on for seven days. While we did not actually test this out we could tell that they are very moist marker which would allow them to stay wet longer. And we did get much use of them being out and lids being off of them for a while between switching colors. They are also nontoxic as well as noscent. Which is great because some markers have a strong scent that hurts my head after awhile. The kids had a blast testing them out and drawing things. We did notice that you have to use a thicker type of drawing paper because the markers do believe through to the backside or to the page under it. Also it is a good idea to test some of the colors before putting them on your drawing because some look a little different than the color on the marker tube. The carring case was nice because it kept them all together. It was flat and compact so you could just put it on the bookshelf. I think these are great for any crafters especially ones that like organization. You can also order a 12 pack if you feel the 24 pack is to much. The kids enjoyed coloring all kinds of things. My daughter enjoyed coloring in her mandala book. And when the little kids colored on them selves it was easily washed off. They also enjoy taking it on the go being able to carry it to the car. This is out of her mandala book and as you can see the colors are vibrant and bold. Even with the thick card stock paper they still bleed through. Which isn’t an issue for these pictures since they have nothing on the backside of them. We also just make sure to put more paper under anything we are coloring. My little ones made little puppets with the markers and popsicle sticks. They had made several but when I would go to get pictures they would hide them haha. If you or your children like to color with markers you should check these out! Be sure to check them out on social media outlets as well as what my fellow crew members had to say about it below. Also the wonderful people at The Pencil Grip, Inc are giving away a 24 pack of The Magic Stix Markers to one of my readers. Be sure to enter below for your chance to win. Prize will be sent directly from The Pencil Grip, Inc.